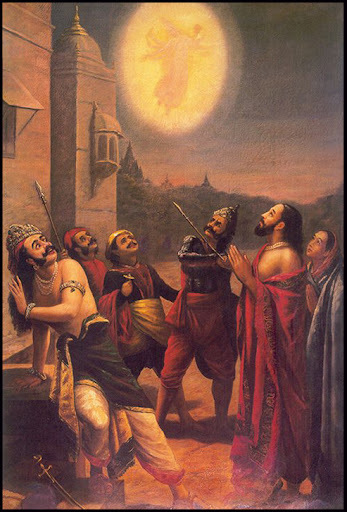 Raja Ravi Varma (April 29, 1848 – October 2, 1906) was an Indian painter from the princely state of Travancore (presently in Kerala) who achieved recognition for his depiction of scenes from the epics of the Mahabharata and Ramayana. His paintings are considered to be among the best examples of the fusion of Indian traditions with the techniques of European academic art. 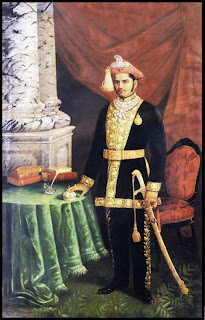 In 1881, Sir R. Madhvarao, the British Regent of the State of Baroda decided to invite Ravi Varma to paint the ceremonial portrait of Sayajirao Ill, the Gaekwad of Baroda. Sir R. Madhvarao, who had earlier been the Dewan of Travancore, was a great admirer and also familiar with the artist’s work. At Baroda, Ravi Varma was welcomed as a privileged guest and all facilities were extended to him. A special studio was built in the palace grounds. 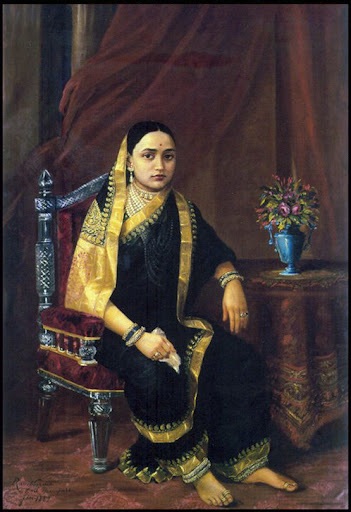 The various assignments from the Gaekwad of Baroda brought Ravi Varma much renown and fame. Princes from different native states of India sought his services and he was invited to Bhavnagar, Puddukkottai, Mysore, Bikaner, and Jaipur to revive pictorial art history in their states. Though born in Travancore, he was the first of a new generation of Indian artists to cross regional barriers in receiving commissions and executing paintings on a pan Indian level. 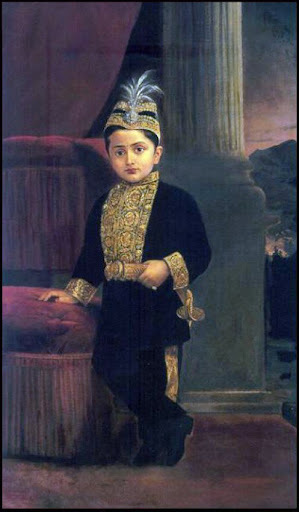 During his stay at Baroda, Ravi Varma provided Lakshmi Vilas Palace, with two dozen large canvasses depicting episodes from the Mahabharata, Ramayana, as also a good number of family portraits. His brother, C. Raja Raja Varma, and sister Mangalabai Tampuratty assisted him. 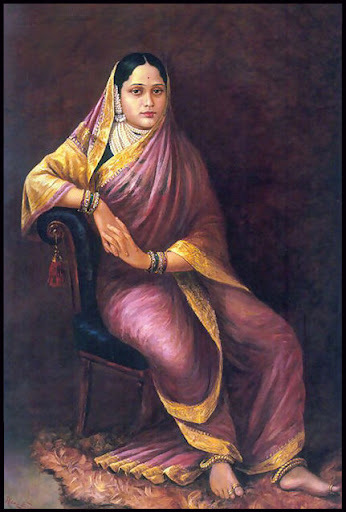 These are the best works of Ravi Varma. Several paintings like Nala and Damayanti, Radha & Madhava, Arjuna and Subhadra, Bharata, Shantanu and Ganga, Shantanu and Matsyagandhi, Vishwamitra and Menaka, Krishria Drishtha, Radha waiting for Krishna in Brindavan, Shakuntala writing letter with two sakhis, Mitrayani & Priyamvada and Urvashi, sleeping beauty, Lakshmi & Saraswati are in Baroda Museum & Palace.